Suppress the theme's header and footer and use Beaver Builder to construct your own header and footer by creating row layouts that could include a Menu module. Save the header and footer as rows and use them on any page in your site. Global rows keep the content synched across pages, standard rows insert the content but let you change it for each page. See the Related Articles for more information about saving rows. 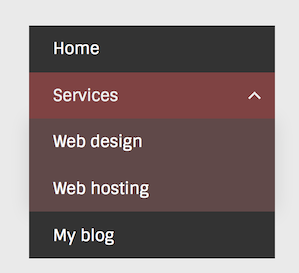 Use your theme's standard header with menu, then create a footer row with a Menu module that uses a different menu. Save a Menu module and use it in shortcode in a text widget. 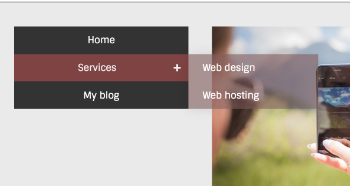 There's a Custom Menu widget in WordPress, but the menu module gives you more control over styling without resorting to CSS. See the Related Articles for how to use shortcode in widgets. 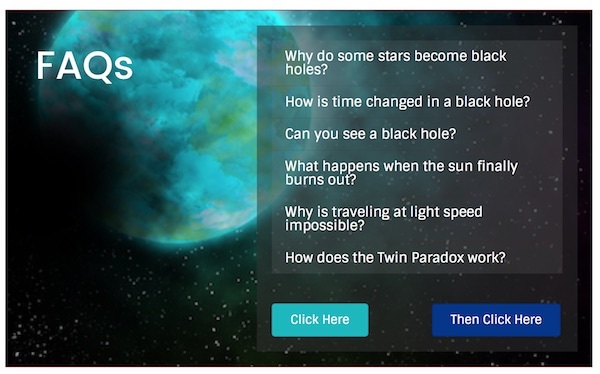 If you have FAQs that contain fairly long answers, create a separate Post for each individual FAQ, then create a menu item for each Post, then use that menu in a Menu module embedded in your page content. That menu serves as a table of contents linking to the Post that contains the answer. 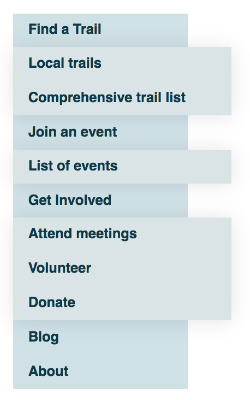 The following screenshot shows an example of a menu used as an FAQ table of contents. The Menu module has the following four different menu layout options. For the first three options, you have a choice of an arrow or plus sign to display the submenu. 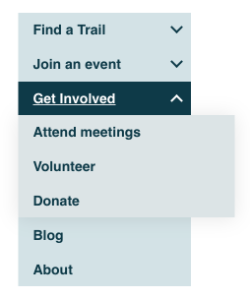 A standard horizontal layout that supports dropdown submenus, with a choice of down arrow, plus sign, or nothing. These two screenshots show horizozntal menus with an arrow for the submenu. The submenu is opaque in the upper screenshot and semi-transparent in the lower menu. Note that with accordion layout, submenu opacity background is 100%, no matter how it's set on the Style tab. In the following screenshot, the submenu background opacity is set at 60% but appears at 100%. You can choose how to display the menu on mobile devices: the expanded form, a hamburger icon, a MENU label, or both the hamburger icon and MENU label. There's also a setting for the breakpoint at which the changeover to the hamburger icon or MENU label appears: By default, it appears on small devices only, but you can change the behavior to medium and small devices, or all devices. Inline means that the expanded menu falls below the hamburger. This works for centered menus but doesn’t work if, for example, you have a hamburger in a small column on the right. The menu gets squished. Below row removes the menu in the markup and puts it below the column that the menu is in. This means that expanded menus in small columns still appear inline but don’t get squished. Overlay will overlay the expanded menu on top of the content below. Notes: If you are using the Beaver Builder Theme, the font-family is what you defined for page content in Customize > General > Text and cannot be customized on the Style tab. By default, the menu link colors appear in the color you defined in Appearance > Customize > General > Accent Color, and you can customize this color. The menu will not collapse and all of the menu items will show in an unordered list style format. The menu collapses as the screen becomes smaller, and a hamburger icon (horizontal lines) toggle button appears. The menu collapses as the screen becomes smaller, and a hamburger icon toggle button plus the word MENU appears. This option displays a button labeled MENU, similar to how the Beaver Builder theme works.